Congratulations on your new drum! It will bring you years of enjoyment and will stand up to the rigors of schlepping around. A few points to keep in mind: If your drum was recently made and a new skin was put on as a head, there may be an initial break in period where the skin will stretch. You will notice this if the drum seems lower in pitch or develops a more prominent ring than it normally would have. This break-in period may last up to two months. During this time you may want to tension the head with the rope by following the method below. We will also do it for you and teach you how to do it yourself for free! If the surface of the head is rougher than you like, you may sand it down with a VERY FINE steel wool and go lightly. Or, you can simply play your drum and in time, the skin will get smoother. Humid weather definitely makes the pitch lower and any ringing more prominent. If you wish to enrich the wood, please use karite or 100% pure shea nut butter. And, you can add some real coconut oil. 85/15 is good or just the shea butter. You would massage this into the wood (where there is no rope), applying pressure and your drum will be better protected from the elements. Another way to apply this is melting the shea butter (alone or with coconut oil) in a pan or tin, and using a brush to apply liberally to the drum. You can do the outside and as much of the inside you can get to. This is a product we carry. $10 plus shipping. Or ask us to bring it to your next class! The coconut oil should be taken from a coconut, if possible. It can also be purchased from us at $10.- (Obviously, if your djembe came with a very glossy coating on the wood, the shea oil will not do much as the wood is sealed.) Our drums are NOT made with a poly coating and breathe like a musical instrument should. Remember that the skin is usually from a goat and that it will have normal imperfections. The head is guaranteed against defects like this for a period of 6 months. Tearing or damage caused by sharp objects, extreme heat or cold, or excessive moisture are NOT covered under the warrantee. The shell (the body of the drum) is warranteed for 1 year against cracking and will be repaired or replaced by us if this would occur. It usually does not and your drum may last a lifetime or more! Small cracks can rarely develop unexpectedly at times. A little wood filler is what is most often used. We can help you with this if needed but feel free to work with your new drum to nurture and play with the skin and the wood. It makes it even more pleasurable to play! NEVER put any product (oil or cream) on the head no matter who tells you to. Even the BIG- O!, Anyone - just say NO! The skin has fibers that are stretched tight and any emollient may weaken those fibers. 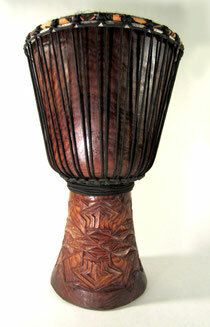 The skin on most djembes is GOAT skin and it is thin. Conga drums and dununs usually have a thick skins, like cow, and on that, it would be fine to use a cream and sometimes a very good thing to do. Try to never keep the drum in a sealed up car on a hot day. If you have to...keep the windows cracked and put a sunshield in the window. Park in a garage or at least under a tree. Better to put it in the trunk, we think. Try to keep the drum out of extreme cold for long periods of time THOUGH the cold is not nearly as damaging as a hot car all shut up like a pizza oven. Try to keep drum in a dry environment. Humidity and dampness are bad for the head and the wood too. No dramatic climate changes if possible. We have often seen problems with drums kept in a damp basement or stored near the ocean. Do NOT store your drum in a damp basement or near the ocean! Or use a good dehumidifier. If you want to super care for your djembe and you have a case, buy or make a moisture reducer and put it in your case or in the stem of the drum. It may keep the djembe in tune more and make the skin last longer. https://www.amazon.com/Charcoal-Purifying-Neutralizer-Freshener-Bathrooms/dp/B07DTHDDVK?crid=FZPBBMKRZNOC&keywords=moisture+absorber&qid=1539810577&sprefix=moisture+%2Caps%2C148&sr=8-23&ref=sr_1_23 Just click or look on Amazon for ‘moisture absorber’. I hear you can also use some non-smelly kitty litter in a sock! Almost free! Neat trick! No sharp objects. Do not wear rings or bracelets and most watches when playing! Don’t let a stick and a djembe inhabit the same room where someone may think, “Drum, stick. Hit drum with stick...makes sense.” Don’t invite this from a child or an adult. Kids will pick up a stick and it makes total sense, to them, to hit a drum with it. THE place where a drum can get hurt is when it is NOT in its case and one walks through a doorway with it. I have a rule: when the drum is transported uncased and I'm going through a doorway, I put the drum IN FRONT of me till I am clear and then put it on my back or side or on it's wheeler. I wheel my drum everywhere with an inexpensive all plastic luggage carrier from Kmart. Honestly, the more years I do this, the drum goes in its case even if just going up or downstairs. Whether you should store the drum in its case or out of its case is up to you. I have found that djembe stored IN the case, often get into trouble. Mold can grow, bugs can develop. I think it is better to store the drum to the air. If you have animals or kids (same?) you may want to think about how they react to the drums. You can put a towel on the drum to cover it a bit and that protects it a little but lets the instrument breathe. FYI, to ‘rehead’ a djembe (because the head brakes or has lost it’s sound) costs between $100 -$150 depending on what it needs. (Like new rings, rope or wood repair). If you want special skins to replace with, it can even be more. Finally, if you do not own a drum case, please consider that protecting your drum is very important and getting a good case is really worth it. We have cases at all price points from $35, $50, $80, $150, and $175. You get what you pay for in the cases as is true with the drum. The only thing here is don't get a case that is going to add 5 lbs to the carrying of the drum! I use an $80 case as do most of TDC teachers. I have had mine for 17 years. Get a case! GET A CASE! The place a djembe LOVES to be is in the sun on a nice warm or hot day where it won’t get stolen:) Fresh air and warm, direct sunlight seem to bring out the best in a djembe skin. 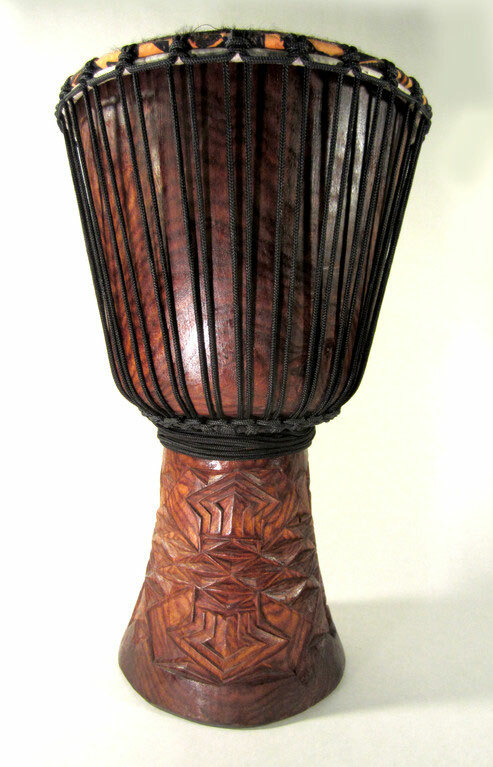 The djembe also LOVES to be played and played with good technique. 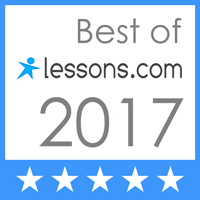 Consider class or private lessons with a qualified djembe teacher. And check those qualifications. I am recently hearing that some teacher played in African ballets and studied with blah, blah, blah and it's scary to hear about. When a teacher is all about bravado, chances are they are making up for something. A teacher should be able to meet you at your level and clearly and calmly get you to play like them, period! If not, move on. The life of the djembe skin is extremely variable. I have a great drum with a head that has been on for 7 years and it sounds great! Many people get 5-15 years of good playing out of a skin. Sometimes, people who want their drum to be perfect will replace a head every few years. For a player of my skills and my playing schedule and demands, 2 years is what I average. I have heard of some of the great players reheading their drums every few months! Your mileage may vary. Tuning: You may not EVER need to tune your drum! But, probably, in a few weeks or a few years, especially during seasonal changes in the Spring and Fall, you may notice a sound change in the skin. Tuning may be needed. Tuning is NOT difficult but it must be learned. Below, I have given you the basics. In a second email, you will get the diagrams and photos that may help you even more. Remember, our DrumConnection team is always around to help you with your tuning needs. Our shop is open 6 days a week to help. DrumConnection style-self holding knot...and no sit-ups! Over 2; under the second and back between the 2. Up and underneath the first and the second. Makes an 'S'. Allow the free end to slip under the bottom bump of the 'S'. Now, with drum standing on your left (and your left hand on the head to hold it) and rope held firmly in right hand...step on the rope with the instep of your right foot (in shoe). And put your weight on the rope as your leg goes to the ground. Release. If you've done everything right, the two ropes will have flipped over each other. (This is a DrumConnection method). Some people call this 'Pulling Diamonds' as it makes a lovely diamond shapeas the drum gets pulled even more. It is also called the 'Mali weave' from Mali, WA. This tuning really needs to be learned in person. If you need my help, we should set up an appointment. Remember, the word 'tuning' usually refers to tightening the djembe to bring the pitch up and get the ring out. If your drum ever sounds 'off' one day, try hitting the top rings with a rubber mallet. This gets the head unstuck from the wood and will make the pitch higher and get rid of that 'funny' sound. Remember that only good things come from drumming :) I often feel a healing when I drum and many have noticed this same occurrence in them. Share your newly found love of the drum with others. It’s good for everybody and you may get a drum buddy to play with you too! Thanks for allowing us to help you on the road to drumming. We are here for you if you need us. Drum in the best of health. "You were born a drummer, you just need to remember." DrumConnection wants you to remember that money received from our drum sales goes directly by bank wire to Africa to help hundreds of people! Thank you.